Ukraine's outgoing President Leonid Kuchma has suggested staging a new poll to end the crisis over the disputed presidential election. "If we really want to preserve peace... let us have new elections," he said. 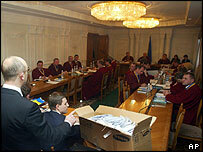 His comments came as Ukraine's Supreme Court considered claims of fraud in the 21 November poll. 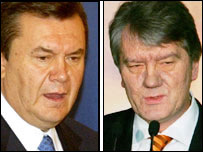 Pro-Russian Prime Minister Viktor Yanukovych was declared the winner of the poll, but opposition candidate Viktor Yushchenko has filed an appeal. Supporters of both Mr Yushchenko and Mr Yanukovych are meanwhile continuing to hold protest rallies to back their candidate. On Monday, Mr Yushchenko told a massive crowd in Kiev's central Independence Square that he would ask parliament to hold a no-confidence motion in Mr Yanukovych's cabinet. 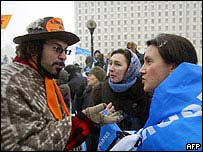 "We will propose the dismissal of the Yanukovych government," Mr Yushchenko told his cheering supporters. Mr Yanukovych's backers in eastern and southern regions have threatened to demand autonomy if Mr Yushchenko becomes the new president of Ukraine. The US and the European Union - who have refused to recognise the official results - have expressed concerns about reports of a possible split. Speaking after an urgent meeting with governors from Ukraine's eastern and southern regions, Mr Kuchma said the country needed a "legitimate president". He said he was ready to seek new solutions even if this meant stepping outside strict legal procedures. "The situation we find ourselves in today in Ukraine demands not only strictly legal decision, but also political decisions," Mr Kuchma said. He also warned that the country's financial system could collapse like "a house of cards" within a few days amid reports from Ukraine's central bank that there had been a rush to withdraw bank deposits. Mr Kuchma - who is finishing his second term - stressed that he had no intention of running for the presidency again if a new poll was called. Last week, the Supreme Court suspended the official results, which saw Mr Yanukovych declared the winner with 49.46% of the vote to Mr Yushchenko's 46.61%. Mr Yanukovych said on Monday he would accept a re-run of the vote in two of his eastern strongholds - the regions of Donetsk and Luhansk - if claims of fraud were proven. But he said he had not seen any evidence of falsification, stressing that the decision of Ukraine's Central Electoral Commission could not be "declared invalid by any legal or constitutional means". Near the court building in central Kiev, several thousand rival supporters stood together, shouting "Yu-shchen-ko!" and "Yanu-ko-vych!" and waving the orange flags of the opposition and blue-and-white Yanukovych flags. Mr Yushchenko's team has submitted thousands of allegations of ballot-rigging to regional courts and one complaint to the Supreme Court. But the government has also lodged 7,000 complaints of irregularities to regional courts. Mr Yushchenko has declared himself the rightful winner, alleging massive fraud. His concerns have been echoed by international observers. But the Supreme Court could take up to a week to reach a decision. The court - seen as relatively independent - cannot invalidate the whole election, but it can uphold a complaint and order a partial or full recount. It could on the other hand proclaim Mr Yanukovych the winner.